Find My Workspace lists over 95% of the business centres market in Chepstow. Simply click Request Quote to check pricing for one office, or Add to Basket for multiple offices. 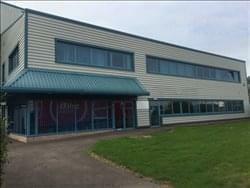 Located on Newhouse Farm Industrial Estate this centre offers 2 carpeted and centrally heated offices with adjoining doors. One office is 206 sqft, the second is 222 sqft. These can be rented separately or together. The offices are fully furnished with desks, chairs and filing cabinets. The office block is alarmed with 24-hour security and there is high speed broadband connection. Tenants have full use of a kitchen, shared canteen area and separate male and female toilets. Cleaning services are provided and there is plenty of secure parking spaces. There is space in the offices which is perfect for meetings. To obtain information for your selected Monmouthshire Business Centres, please tick the "Add to basket" box for each office you prefer and complete the form below. We will then send a detailed report via email.